Since 2009, when audio specialist Sennheiser launched its Mentorship Program to help encourage the next generation of audio engineers to enter the field of televised sports, the company has initiated collaborations among a variety of higher education institutions and professional broadcast networks. 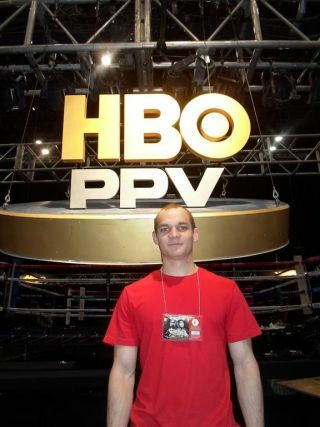 Zachary Templin of New England Institute of Art participated in covering the Mayweather vs. Cotto fight by HBO Boxing. For its most recent mentorship program, Sennheiser selected students Zachary Templin, from the New England Institute of Art in Boston, and Shawn Brewer, from the Conservatory of Recording Arts and Sciences near Phoenix, to participate in covering the Mayweather vs. Cotto fight by HBO Boxing and NASCAR’s Coca-Cola 600 race by FOX Sports, respectively. For Jason Cohen, director of live events, HBO Sports, Sennheiser’s Mentorship Program served to increase the talent pool in the industry. “But, altruistically,” said Cohen, “it allows us to use the power and the tools that we have and give these young, aspiring, career-minded audio technicians the experience and learning that many of us were not fortunate enough to have when we were younger." The race broadcast was done in conjunction with NASCAR, conducted onsite from Game Creek Video's FX truck. During his three days on-site at the racetrack, Brewer was introduced to the main audio production room as well as the track effects and competitor communications submix positions, head-end patchbays, announce booth, track effect microphone setups and communications systems. “It was really valuable to be able to get into an actual broadcast event and see what kind of equipment they’re using, how fast everything moved and what actually goes into running a race of that caliber,” Brewer said.